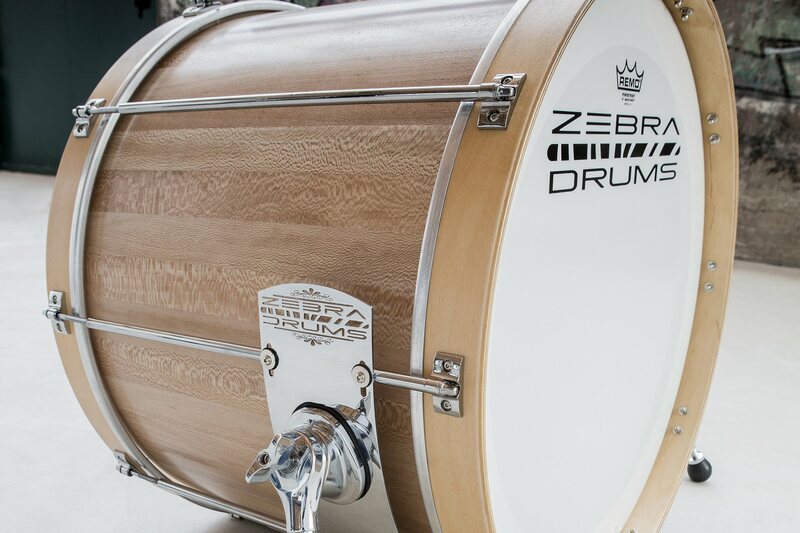 Zebra Drums is a small company owned and run by me (Sjoerd van den Beuken), which specializes in the making of handcrafted solid stave free floating drums. These drums have a different approach to almost everything than a conventional drum does. I build these drums from an engineering point of view together with some plain simple logic. I always imagined building a drum that could offer more to the drummer. More in sound, tuning, tuning range and playability. I found a way by making my own shells, redesigning the free floating concept and creating a revolutionary new suspension. Every shell is carefully made with a strong stave shell construction from a hand picked selection of woods. Very special care is given and much effort is made in creating a stable thin shell without using reinforcement rings. For instance, every shell is glued together with a special fingerjoint. Each size is specifically built to diameter and thickness together with unique bearing edges to get the optimum result in tone and tuning range in combination with the free floating system. Each shell is finished in a matte or semi gloss oil finish. It's also possible to stain the shells in whatever colour you want. The most important aspect of these drums is the sound. With this system you are able to tune your drum better than you ever could using the conventional tuning system. It’s remarkably easy to get an impressive sound out of these drums. You instantly hear a super clear sounding drum without any overtones. This is ideal in studio’s. They even sound bigger than they appear. Quite often I get asked on fairs if the drum kit is amplified, because of the big sound. This system is built not only with practicality but also aesthetics in mind. The sleek design looks both modern and vintage. No unnecessary hardware is blocking the shell from view. Every lug stays in the upright position when the drum is unscrewed, so that the shell can be easily removed. Replacing the heads is a breeze! Every tom or bass drum can be tuned by just tuning the batter head. This way tuning the drum takes far less time and you get a much clearer sound, true sound! Everything can be tuned from your seating position. If you desire different tuning between the batter head and resonance head you can use heads with different thicknesses to achieve this. Every lug is made to my own design in the Zebra Drums workshop. 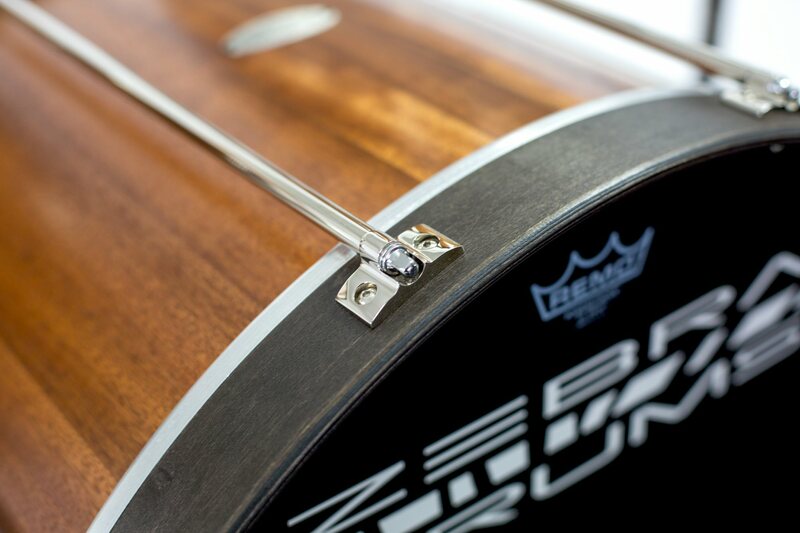 The bass drum claw and the bass drum spur plate is precision cut by a laser cutting machine. This revolutionary new suspension system reacts every time the batter head is struck. It allows the shell to move in only one direction but yet giving the shell all the room it needs to sound to its full potential. It offers a much more stable suspension of the toms and results in a more open sounding drum in comparison to the conventional suspension systems. 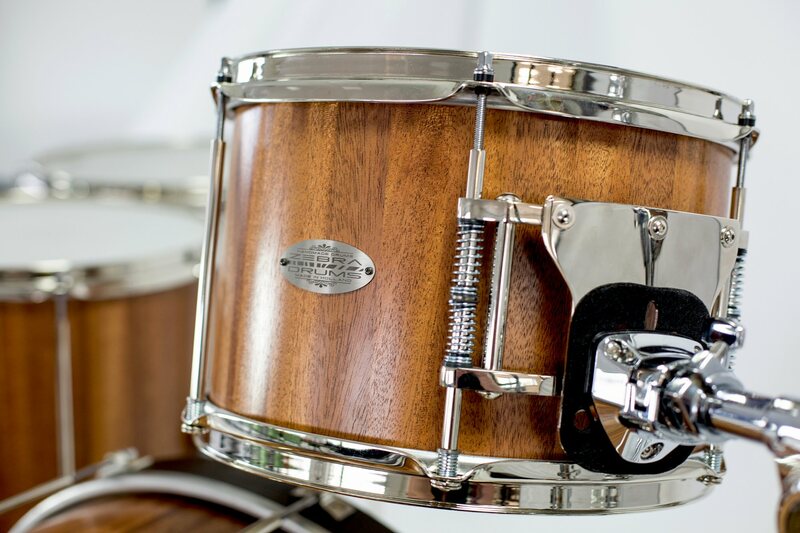 In combination with this unique suspension, the free floating system and stave shell construction these drums give an unbelievable warm tone and offer the absolute maximum in tuning range. I designed a similar system for the floor tom configuration. Every piece of the suspension is custom made. I’ve fitted a universal plate to the suspension so every type of bracket can be bolted on. All tom toms are fitted with this suspension.